A Lodi man is in custody after he was arrested on a number of charges including reckless driving and possession of burglary tools. At 11:30 p.m. on Monday, November 27 Lodi Police attempted to stop a vehicle near Flora and Washington streets after officers observed reckless driving. Instead of stopping, the driver of the vehicle led the officers on a pursuit that lasted for several miles that ended after the vehicle got stuck in mud near Blakely Park. The driver, Joseph Howering, 22, of Lodi fled on foot but was apprehended in the backyard of a nearby residence. 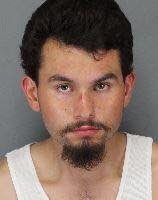 Howering is currently being held at the Lodi City Jail and has been charged with felony evading, reckless driving, felony vandalism, possession of shaved keys, possession of stolen property and possession of controlled substance paraphernalia. No Comment to " Suspect Arrested After Leading Lodi Police on Vehicle, Foot Pursut "